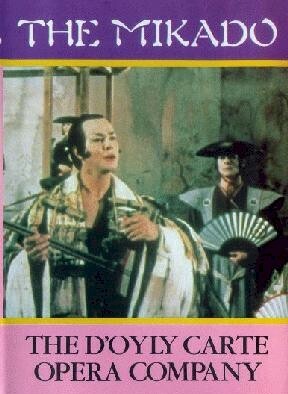 Today we saw The Mikado, produced by Opera A La Carte. On the right is a rare photograph from the D'Oyly Carte productions my family saw during the 1960s and 70s. 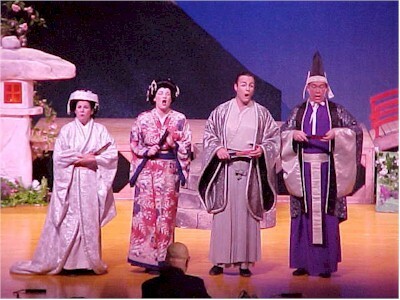 On the left is a photo from a production of the Mikado during January 2002 by Opera A La Carte (Yum Yum, Pitti Sing, Nanki Poo, and Pish Tush singing "Brightly Dawns Our Wedding Day"). The performance was excellent. Costumes, sets, and characters were just what I had hoped for. There was a small orchestra in the pit, including a second trombonist, and the theater was rather full, albeit with a crowd that wasn't especially aware of Gilbert & Sullivan traditions, such as encores. None were performed or called for. Thinking back on the show, I'd have to say that Pooh Bah and Pitti Sing were my favorites. Pooh Bah played his part with a wonderful mix of importance and foolishness. Pitti Sing was playful and belligerent, with a terrific voice. Another who impressed me was Katisha, who played her part with more compassion than I remember seeing before, along with her typical anger in the first act and reluctant standoffishness toward the end. I had a hard time understanding her lyrics and those of Pish Tush, but the others all sang quite clearly. Nanki Poo and Yum Yum were very good, and both had great voices, although Nanki Poo's vibrato went a little over the top at times, obscuring the actual notes of the song. (I kept thinking he sounded a bit like the Lion in the Wizard of Oz... "If I were king of the junguluhuhuhuhuh!") Everyone loved Koko's antics, of course, and he didn't disappoint, although I kept thinking that he looked like one of the Romulans on an old Star Trek episode. Finally, Richard Sheldon as the Mikado was excellent. His wild laughter and threatening yet compassionate eyes were just right. I admire his fair, yet firm (and a bit bumbling) leadership style. When I got home, I found a website with photos from the very company we saw perform, including most of the same actors. Beware, the site is not quiet, so turn your sound down before you click.